SFD: Hi Andrew, thanks for taking the time to speak with us. SFD: Can you tell us a bit about your role in the 25th Anniversary celebration? ANDREW: I am part of the Street Fighter 25th Anniversary team, which is a group of dedicated fighting game fans within Capcom who wanted to make this anniversary one of the best ever celebrated, not just for Street Fighter, but within gaming in general. In addition to being on the initial planning team, which formed the baseline for all our activities, I am personally in charge of all the logistics of the 25th Anniversary Collector�s Set, as well as being the producer in the documentary. But, I am involved in some degree in every element of the celebration. SFD: This has been a big year for Street Fighter fans. 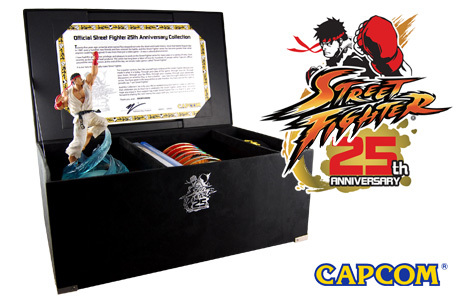 Other than EVO and the announced Street Fighter 25th Collector's Set, what else can fans expect? ANDREW: There�s a lot to look forward to. 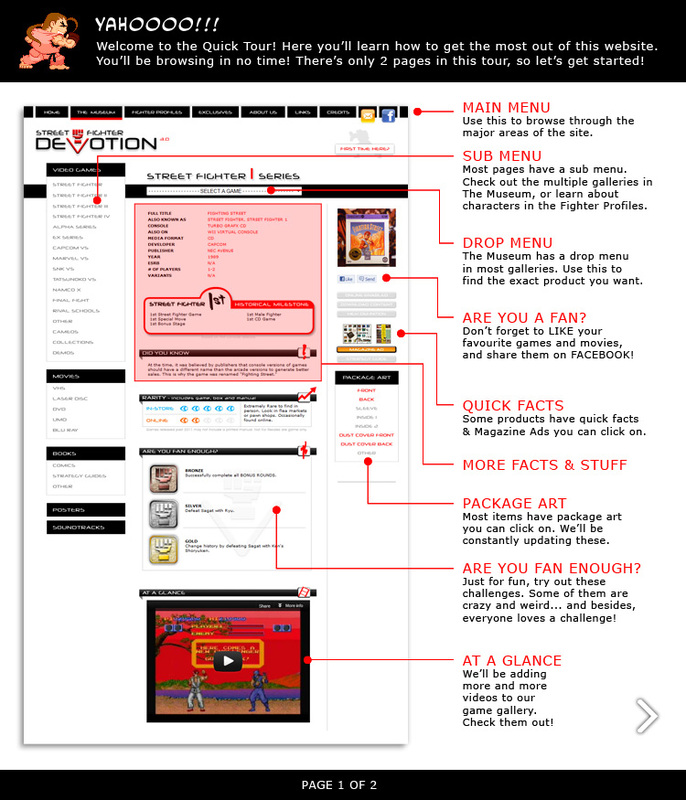 First of all, if you haven�t had the opportunity to check out our website (www.StreetFighter25.com), I highly recommend you do so. On the front page, we have a storyline which basically chronicles every release from the original Street Fighter to Street Fighter X Tekken. What�s cool about it though, is that people can add their own content anywhere within to complete the story. For example, if you dressed up as Guile for Halloween in 1994, you can put a picture of yourself in the Storyline at that point. Furthermore, we just recently launched what we call the �Match Maker�, which allows folks to mark themselves on a map so as to find other players in their neighborhood and around the world. This can either be used to set up online matches, or if it turns out that you have a lot of people in your area, maybe you can set up a weekly tournament. It�s all a way to bring people together. We also will be having a tournament series that spans the entire world. You can find more details at the website above, but it will be a series of qualifiers that eventually culminates in a set of grand finals in San Francisco on December 8, 2012. The games included are Street Fighter X Tekken, Super Street Fighter IV Arcade Edition, Street Fighter III: Third Strike Online Edition, and Super Street Fighter II Turbo HD Remix. The winners of these tournaments have a lot to look forward to, including $25,000 for the winner of the SSFIVAE tournament, as well as a custom 25th Anniversary Scion FR-S for the winner of Street Fighter X Tekken. And, the tournaments will all be streamed to the world. It is the biggest tournament the fighting game community has ever seen, and should be a lot of fun. Looking at some other areas, we are also partnering with iam8bit for an art show/gallery to be held in Los Angeles from August 3-19. We have a lot of great artists in the community, both professional and amateur, and it�s a pleasure to bring some of their great work to a gallery wall. And, of course, we have numerous other updates going up all the time on Capcom-Unity.com, so be sure to check them out. SFD: How did the 25th Anniversary Box Set became reality? What was involved in the process? ANDREW: It was the result of a lot of people putting in a lot of hard work. Back when we began discussing the 25th Anniversary plans, one of the first things that I had thought of was to have an item that would celebrate the series in grand style. Everyone was on board with it almost immediately, and so after figuring out the contents, it was just a matter of logistics. And what logistics they are!. These types of collections are much more involved than you�d think, because we had to make sure we had all items accounted for, set up tribute series to bring in fan art and music, do rights checks and set up royalties for music and video content, produce an entire documentary from scratch, author discs, make sure everything is shipped from four different places around the world in the right timing to pack properly, and stay on budget. Without a team of dedicated people working diligently on it, it would be a practically impossible task. But in the end, we feel it was well worth the effort. SFD: There's a lot coming in this box. How were the contents decided? ANDREW: Basically, when we sat down to decide the contents, we asked, �What is the absolute maximum number of items we can include in here while keeping it at a sane price?� And then we began listing whatever we could think of, fine-tuning ideas along the way. There were a few things we wanted to make sure of. First, we wanted there to be a lot of stuff. One of the initial ideas was to have the whole thing housed in an arcade stick, however, if we did that, we would not be able to include anything else, so we decided against that. We also wanted to make sure that we appealed to multiple types of fans, because people love Street Fighter for different reasons. For the fans of the games themselves (and, by extension, tournament players), we include games and DLC. For artists and fans of art, we have the art book. For audiophiles like myself, we have the 11-disc soundtrack. For people who enjoyed the entertainment featuring the franchise, there is the video content. 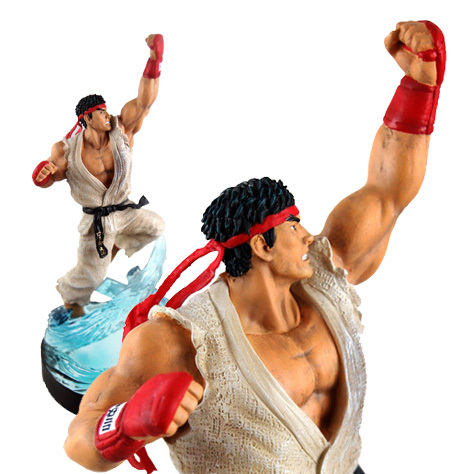 And for the flat-out collectors out there, we have the light up statue of Ryu and the replica belt. This was to push the idea we all believe in that our fans run the gamut of interests, but the fact that Street Fighter has elements that appeal to them all is what makes the series so special. SFD: Fans have been wondering about other games they would have liked to have in this collection, such as the original Street Fighter or Street Fighter Alpha 3. Was there a reason why these were not included? ANDREW: That�s a more than fair question, and the answer is fairly simple � we want to make the value for the fans as best as we possibly could. As I mentioned before, our goal was to put in as much content as we possibly could without making the game cost prohibitive, and wanted to ensure that all content we put in could be played by modern console players. And putting games on current generation consoles is not as simple as using an emulator on a PC. There are dev costs, submission costs, licensing costs, etc. And if we are only including the games as part of this limited edition set (as only 30,000 will be made available ever), the cost per unit rises dramatically. As such, we had to make the very difficult choice of leaving those products out for the good of the value to our fans. Having said that, we do have good news for PlayStation 3 fans. When we showed off the Collector�s Set to Sony Computer Entertainment of America, they were eager to join in on the celebration of the anniversary. Sony has always been a great partner of ours, and a great friend to the fighting game community, so we were thrilled when they offered to throw in, at no additional charge for consumers, all three Alpha games as PSOne Classics, Alpha 3 Max as a PSP download, all the SFIII Online Edition DLC, and over 175 avatars spanning throughout all iterations of Street Fighter. These will only be available on the PS3 version, so it�s definitely something to look forward to. SFD: What resolution will the different movies and television series be in? ANDREW: While I would love to see Bison say �This is Delicious!� in HD, the items which were originally in standard definition � that is to say, Street Fighter II: The Animated Movie and the Street Fighter animated series � will remain in standard definition. The two original movies for Street Fighter IV and Super Street Fighter IV, as well as the brand new documentary, will be available in high definition. SFD: Will the XBOX 360 version of the movies come in BLU-RAY format or XBOX DVD? SFD: This will be the first time the SUPER STREET FIGHTER IV movie will be available to North America. Is it dubbed in English? If so, was it dubbed specifically for this Anniversary Box set? ANDREW: Yes, the movie (or as some have called it, the �Juri Anime�) is dubbed in English. This was actually something that came up as far back as when Super Street Fighter IV came out. Many people have seen the movie in Japanese, and we got a surprising number of requests to have it translated. With the Collector�s Set, we finally had a solid place to release it to fans, and so that�s how the translated version found its way in. SFD: The Documentary sounds very interesting. What can fans expect to see? ANDREW: We wanted to do something different with this documentary. Originally, we were thinking about providing a simple overview of the games that have come and gone in the series. However, many others have done this, and have done it well. (In particular, I think GameTrailer�s �Street Fighter Retrospective� did an excellent job of this.) So, we considered, what�s important beyond the games themselves. The answer is simple � people. Without people, the games have no meaning. Our anniversary tagline and title of the documentary is �I am Street Fighter�� and is meant to emphasize the importance of the fans to the brand. The Street Fighter series has left a big mark on everyone it has touched, and vice versa. This is what the documentary focuses on: 25 years of inspiration. In it, we speak with game designers (both in and outside of Capcom), pro players, artists, musicians, arcade owners, and other community influencers, all who have a special relationship with the franchise. It speaks beyond the games, and makes it clear to see that Street Fighter is not just a brand � it is a phenomenon. 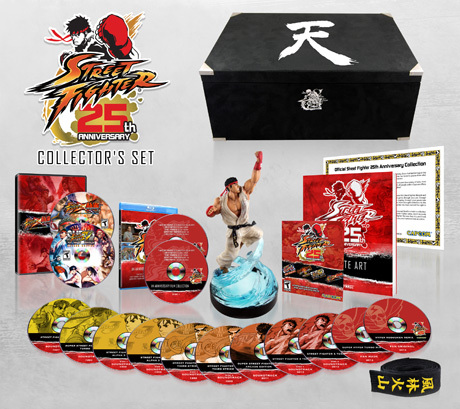 SFD: Other than the games, will any of the other items (such as the Super Street Fighter IV movie and Documentary) be available separately for retail later on? ANDREW: We have no plans for making those available separately at this time. In fact, some of the items (the art book, statue, and belt) were made just to be exclusive to the set. SFD: This seems like a really huge collection for just $150. Is there even a profit to be made from this? ANDREW: Let�s just say, with this package, our primary focus was on putting together something special for the fans as thanks for their years of love and dedication. SFD: Other than the contents described in the package, will there be any extras? Are there bonus features for the documentary and movies? ANDREW: There are no extras on the disc itself, but we do have plans to push out some deleted scenes and other goodies on our YouTube channel, Facebook page, and of course, Capcom-Unity in the months following the release, so stay tuned! SFD: I hear A LOT of international fans wanting to purchase this collector's set, which to my understanding is produced exclusively for North American retail. How can our international friends import this collector's set? Was an international collector's set considered? ANDREW: We were hoping to have an international Collector�s Set from the get-go, and we pushed for it for about six months. Unfortunately, this is one of those situations where the logistics and external factors made this too difficult for us to pull off. SFD: What does this collector's box weigh? ANDREW: It�s a hefty 6.25 pounds (or about 2.84 kilograms for our metric friends). SFD: This year celebrates the 25th Anniversary of another brand that's very special to us. What can fans expect? ANDREW: While I cannot talk about anything specifically, I will say that we at Capcom are well aware that Mega Man will be celebrating his 25th birthday in December of this year. SFD: How did Street Fighter affect your life? ANDREW: To sum it up, it took away my money as a child, and gave me some back as an adult. My story is incredibly common � I lived near an arcade that had Street Fighter II, and I played the hell out of it. I didn�t know what I was doing at the time (some may argue this is still the case), but I enjoyed every moment of it. One of my absolute favorite parts about it, and something I still absolutely love about Capcom fighting games, was the animation of all the characters. When you take the time to appreciate how Vega arches his back when throwing a character, or see Blanka�s eyes pop out for the first time when KO�d, you really see the artistry that goes into it all. To think that I have the opportunity to work on this brand, which has affected not just my life, but the entire culture of a generation, is something I find completely surreal and exciting, and I�m honored to be a part of it. SFD: Do you think Street Fighter will make it to its 50th Anniversary? ANDREW: Unless we�ve somehow collected into some sort of soulless hive-mind by that time, absolutely! What�s great about Street Fighter is that its essence is so simple and yet so profound. It�s not about a single character that might become irrelevant due to changes in society at large. There are a large number of characters, and they are all variable, able to shift in subtle but important ways to stay relevant while staying true to their roots (which is why Zangief is now a Russian patriot instead of a Soviet one). But more than that, it is about the fight, the thrill of competition, the desire to perfect yourself in whatever you do. And those ideas are absolutely timeless. SFD: If you were in charge of the 50th Anniversary Box Set, what do you imagine it would be like? ANDREW: Call me an optimist, but I like to imagine that virtual reality would have actually been perfected by 2037, and we might be able to include something in there that lets you jump into the fight � literally! (Obviously, you�d be given some powers, or else it wouldn�t be a very fun fight.) We�d also need to complete the Ryu cosplay theme. At this point, we have headbands and belts, so maybe the gloves? Hopefully we could get the full set by year 100. Thankfully, we don�t have to worry about shoes! SFD: Thank you so much for your time Andrew. It�s been a real pleasure. Keep in touch! ANDREW: The pleasure has been all mine! 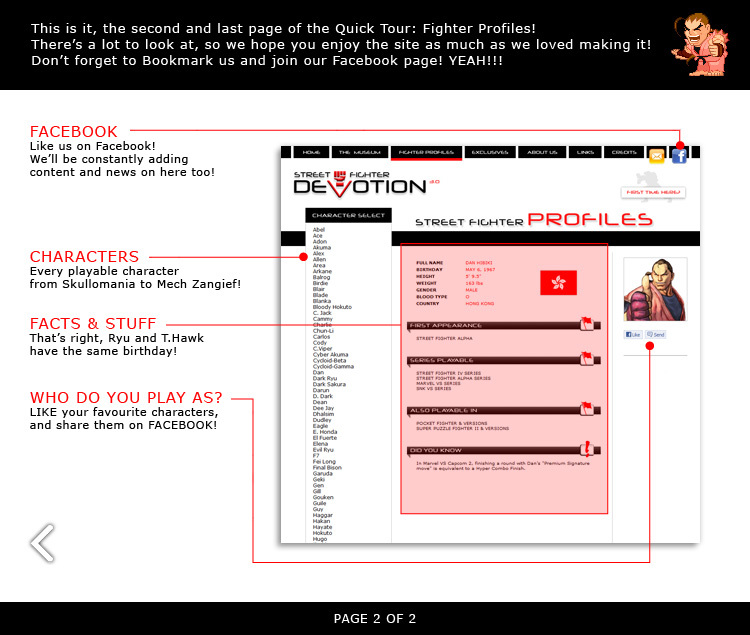 Many thanks to Street Fighter Devotion for their support of the Street Fighter series and community!